Over the last six years, most of the companies that made the largest donations to local school bond campaigns also received contracts to work on the district’s bond program. A four-month Voice of San Diego investigation into local school bond campaigns, including public records gathered by NBC 7 San Diego, revealed a pervasive pattern: In 13 of the 17 local school districts that have issued bonds since 2006, a significant correlation exists between the major donors to the district’s bond campaign, and the companies that won work on the bond program. There are consultants to pay and mailers to print. There are campaign signs to erect and robocalls to record. It’s a complicated, costly process that can take months of planning and often requires tens or even hundreds of thousands of dollars. “You can’t bake-sale your way to a bond measure,” Tim Baird, superintendent of the Encinitas Union School District, likes to say. Those donations aren’t supposed to influence districts when it’s time to start handing out work to finance and build projects paid for by the bonds. School officials and trustees are supposed to pick the firms that will give taxpayers the best deals on loans, financial and legal advice, and construction work. Eight companies donated more than $5,000 each to the campaign for Poway Unified School District’s Proposition C, which passed in 2008. Seven of those firms won contracts with the district. Five companies gave the Oceanside Unified School District’s Proposition H campaign more than $5,000 in 2008. They all won contracts to work on the bond program. Every one of the 12 companies that contributed more than $5,000 to the Grossmont Union High School District’s Proposition U campaign in 2008 won a contract from the district. Donations aren’t a guarantee of work. At some districts, donations of more than $10,000 did not result in contracts for the donors. Similarly, some of the biggest winners from local school bond programs didn’t donate a cent to bond campaigns. School district officials across the county said donations to bond campaigns have no impact on who is selected for contracts. The staff members who choose which companies win contracts often don’t have any idea who has donated money, officials said. Last fall, Scott Buxbaum was trying to get the Proposition C bond campaign for the Cajon Valley Union School District in El Cajon across the finish line. So, Buxbaum, the district’s deputy superintendent of business services, picked up the phone. He heard something he wasn’t expecting. The company would only write a check to the campaign if the district was prepared to sign a contract stating that it would underwrite Cajon Valley’s bonds, Buxbaum said. Bond underwriters, often large Wall Street banks, are typically some of the highest-paid of all the firms that contract with a school district. And they’re big donors to school bond campaigns. Unlike construction firms, which are usually awarded contracts only after a district has considered bids from several companies, underwriters seldom undergo a competitive bidding process to win a district’s bond business. Norby said the bond campaign process has been “hijacked by Wall Street.” Expensive campaigns are now bolstered by Wall Street banks, a far cry from PTA groups going door to door to promote school bonds, he said. “There’s no honest community debate,” Norby said. A letter to Ashburn from Stratford Shields, then-managing director of Morgan Stanley, laid out the bank’s reasons for supporting tighter rules on donations. “There are many cases where there is an appearance that only the contributing firms to a bond ballot election committee have an opportunity to compete to provide financial services for the bonds,” Shields wrote. 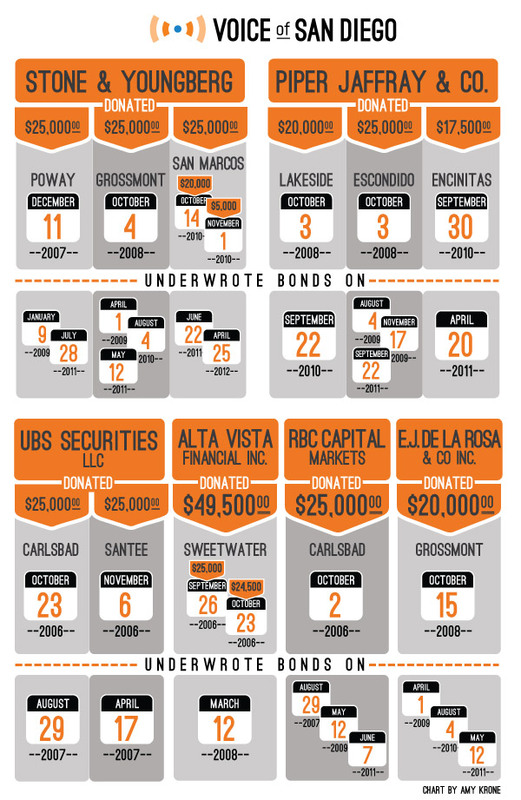 School bond underwriting across San Diego County has been dominated by six firms since 2006. In that time, those companies donated more than $280,000 to bond campaigns between them. Almost every time an underwriter donated more than $5,000, it won a lucrative contract to underwrite the district’s bonds. In 2011, the underwriter Stone & Youngberg netted $813,751 for underwriting Poway Unified School District’s now-infamous billion-dollar bond deal. Poway’s bond campaign committee had received $25,000 from Stone & Youngberg four years earlier. The Sweetwater Union High School District paid two underwriters almost $1 million combined to buy their bonds in 2008. One of those underwriters was Alta Vista Financial, Inc., which donated almost $50,000 to Sweetwater’s bond campaign committee 16 months earlier. “It is our opinion that a school district or other local agency may not condition the award of an agreement to provide bond underwriting services on the underwriter also providing campaign services in support of that bond measure,” Legislative Counsel Diane F. Boyer-Vine wrote in a 2010 letter to then-state Sen. Roy Ashburn. “We will not make, or indicate a willingness to make, any financial contribution as a condition to being retained as an underwriter,” she wrote. Once a school district has sold its bonds, it’s time to hire construction firms: architects to design the buildings, construction managers to oversee projects and general contractors to run each construction site. In a lease-leaseback, a school district leases a piece of property to a developer, usually for $1 a year. The developer then leases that property back to the district while it is building on the site. The “rent” the district pays over time for this second lease finances the cost of the project’s construction. And he said the lease-leaseback method has been bastardized from its original purpose — to help districts that couldn’t afford to fund projects upfront. “Anytime you introduce the possibility to deviate from the lowest sealed bid, you introduce the opportunity for influence, favoritism, possibly fraud, possibly corruption,” Carlin said. In Poway, two local construction firms wrote large checks to the school district’s Proposition C campaign in 2008. Douglas E. Barnhart, Inc. donated $49,999. Echo Pacific Construction, Inc. donated $60,000. Barnhart was awarded two lease-leasebacks. Echo Pacific hit the jackpot — it was awarded 13 lease-leasebacks under the district’s bond program. In Sweetwater, two of the four companies chosen to complete lease-leasebacks for the district’s Proposition O bond, which passed in 2006, had earlier contributed more than $5,000 to the bond campaign. David Dudley’s company, West Coast Air Conditioning, donated $10,000 to the Cajon Valley Union School District’s Proposition D campaign in 2007. Dudley’s family trust donated another $20,000 on the same day. Lease-leasebacks offer districts — and taxpayers — all sorts of benefits that don’t exist when companies are chosen simply on the basis of cost, said Baird of Encinitas Union. Just as an individual homeowner wouldn’t necessarily choose the cheapest craftsman to repair his home, Baird said, districts should be able to choose contractors based on experience and their prior relationship with the company. The need to ask companies for money, combined with a district’s ability to hand out contracts based on factors other than cost, creates an atmosphere that’s ripe for corruption, said Bob Stern, former president of the Center for Governmental Studies, a now-defunct watchdog group in Los Angeles. Buxbaum said the Cajon Valley district’s 2012 bond campaign placed a $2,000 limit on contributions, specifically to send a message that contracts couldn’t be bought. Other districts haven’t followed suit. The second-largest successful school bond campaign in San Diego County last year was Proposition AA at the San Dieguito Union High School District. The measure asked voters to approve the district selling almost half a billion dollars’ worth of bonds. The campaign contributions list for Proposition AA is a who’s who of construction and bond finance firms. Five companies each donated $25,000 to the district’s bond campaign, including one underwriter, three architects and one large construction firm. Update: We’ve changed the reference to NBC7 to more accurately reflect the station’s involvement in this story. Will Carless is an investigative reporter at Voice of San Diego and Wendy Fry is a reporter for NBC 7 San Diego. You can reach them at will.carless@voiceofsandiego.org and Wendy.Fry@nbcuni.com.